My customers often ask for card ideas for the Males in their lives so tonight I decided to give it a try. As we make 6 cards in the class I wanted to keep it fairly simple, but of course it had to be eye-catching too. 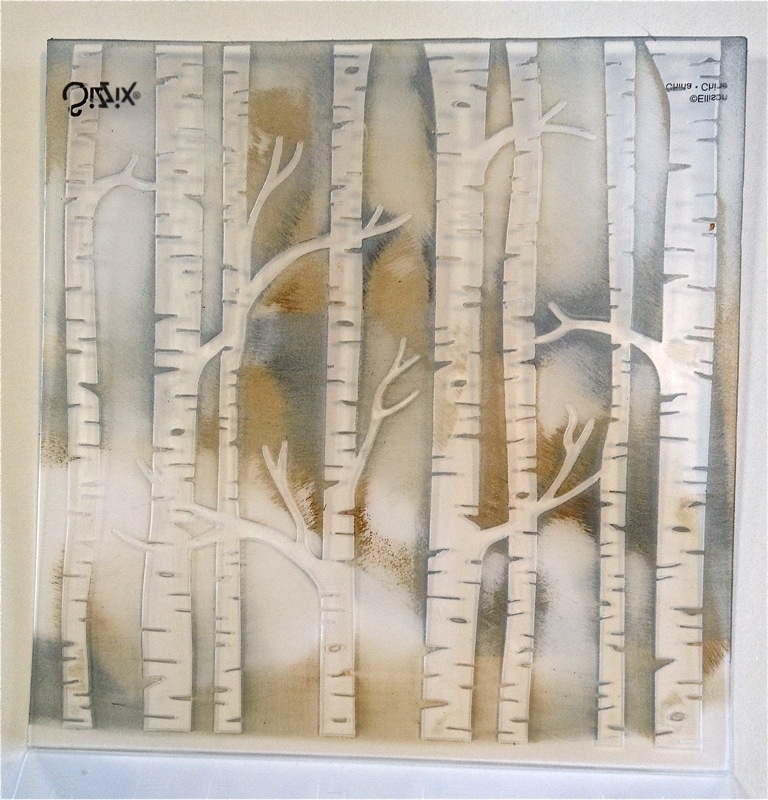 One of my favourite folders is the Woodland Textured Impressions Embossing folder - gorgeous in its own right, but I wanted something different. 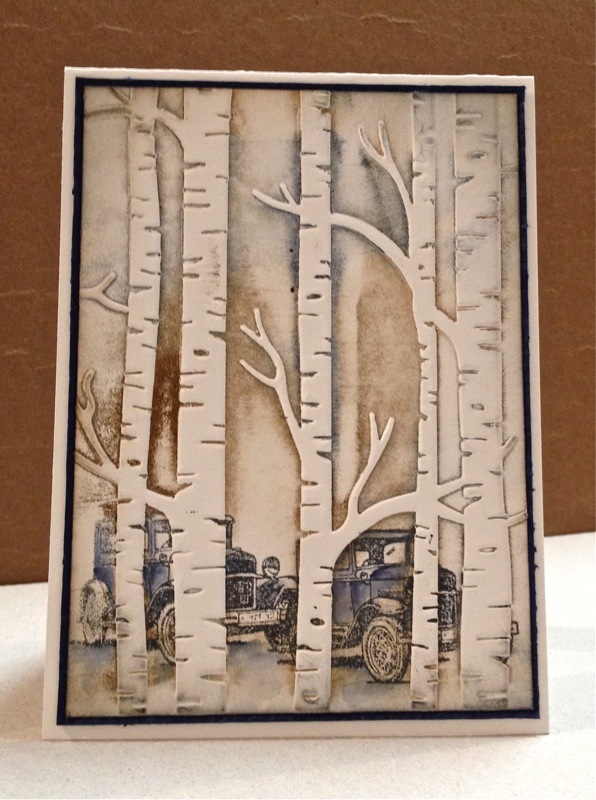 We were also using the Guy Greetings stamp set with some of the other cards so I worked out how to get the vintage car image behind the trees. Here is the complete card. So how do you get the image behind the trees? It really is quite simple. First you swipe the folder with ink. I used Soft Suede and Night of Navy. Swipe across the folder so you get a random coverage and also get those gorgeous lines on the trees. Remember to swipe behind the side that has the "Sizzix" label on it (top Left corner) so you get the tree trunks as a positive (raised up) image. Just be careful not to put too much ink where you are planning to stamp. Also start with the lighter colour (Soft Suede) leaving clean spaces to add the Night of Navy ink. This is also swiped on randomly using the ink pad directly onto the embossing folder. 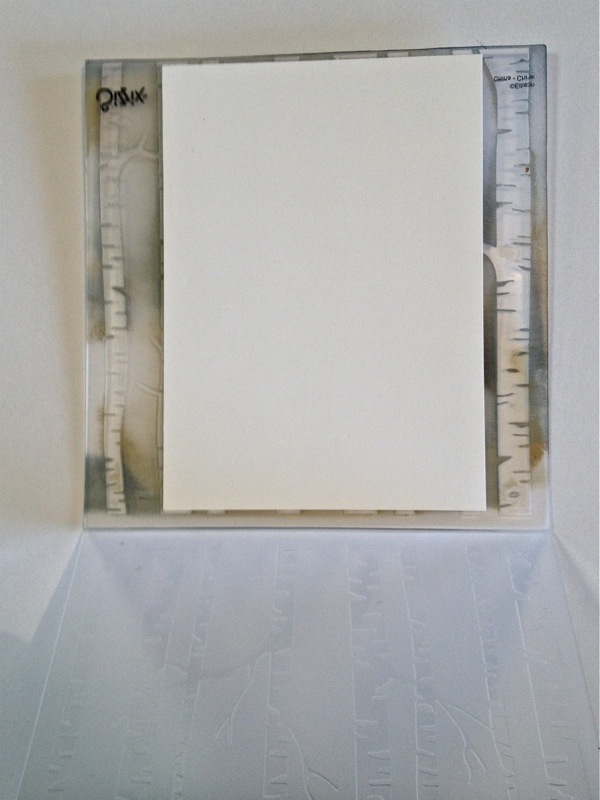 The embossing folder is open with the fold join at the bottom of the photo. Next you will stamp the car images directly onto the same part of the embossing folder in the position you want them to be. I used Memento Jet Black for this. Be careful to stamp straight down and up or you may smudge the image. I found a better image was achieved by holding the stamp in position for a couple of seconds giving time for the ink to transfer to the embossing folder. Voila! A really interesting image for you. It's always a bit serendipitous as to the outcome, but that is one of the joys of this technique. And yes the images print in mirror image so your cars will be heading a different direction. I wanted to highlight the cars a little more so used an Aqua Painter and the Night of Navy ink to colour sections of the car, and some Soft Suede on the ground. To add more definition to the image I sponged both Soft Suede and Night of Navy around the edges of the card before matting onto a Thick White cardstock base. I have so many ideas of how to use this technique now, and cannot wait to try them. It really is easy and quite quick to achieve great results. I've taught this in 2 classes now, and it works in a group 0f 8 quite comfortably! I hope you have enjoyed this very rushed blog post, and that it helps you to give the technique a try. Wow!!! This is amazing. Love the card. Can't wait to try this technique. 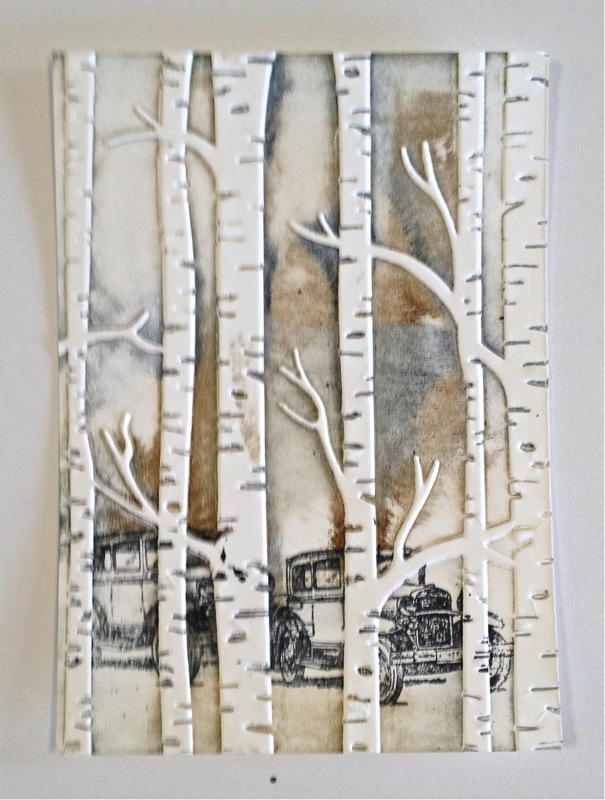 What a beautiful project and great technique...thanks for the share. To clean the embossing folder do you just run water over it and dry it? yes you do just run the folder under running water. I used all water based inks for easy clean up. Am ordering the stamp set and going to give this a try, how beautiful. Your creative use of this folder is fabulous! I came here after watching a video from Cynthia Millan who credited you with this idea. Thank you so, so much for sharing! Great technique. Certainly a unique use of the embossing folder. Another technique for me to try. Thanks for sharing. 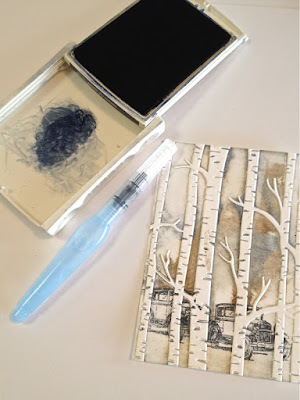 Just another way to use an embossing folder,beautiful. Thanks for the tutorial,I'm definitely going to try this. I too saw Cynthia Millan's video and had to check out what inspired her so much. 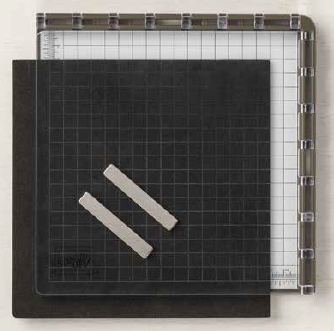 Your card has simply brought a whole new level to using these embossing folders. My mind is swirling. I cannot thank you enough for this creative and beautiful use of not only the folder which I love, but additionally adding the cards from the Guys Greetings. Simply wonderful! Wow, this is such a stunning card and what a great technique! I will certainly give credit and praise to you! 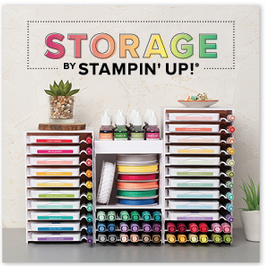 Thank you so much for yet another fantastic way to using embossing folders!!! Stunning crad, and superb use of the folder , thank you so much for sharing the how too! 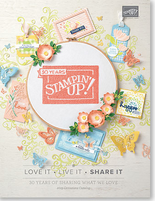 just found your blog over Facebook Stampin' Cafe! Thanks for your tutorial! Th♥nks for sharing! Your card is such an eye catcher! Very interesting ...and quite nice. TYSM for sharing! Will certainly try this. Fabulous!! Thank you for taking the time to explain the technique. The colors you chose look magnificent together! I loved this as soon as I saw it and immediately had to make some cards of my own with it :) Thank you for sharing the ideas, Ann! Stunning! Thanks for the tutorial. Beautiful card. Thank you for the instructions too! Can't wait to give this a try. Thank you for this tutorial. Made it yesterday with some costumers and they loved it. Stunning! Thank you for sharing. Wow!! Thanks for the beautiful artwork and for sharing your instructions! Such a great technique. Love it!!! Thanks for sharing. 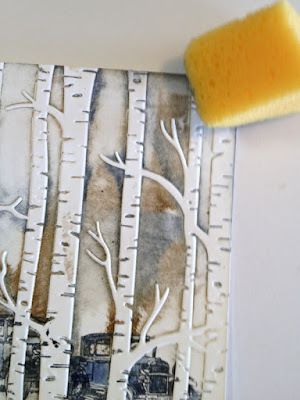 I feel in love immediately, thanks so much for showing and explaining this technique, it is so amazing, I just tried it, and will look for further stamps to use with! That is absolutely brilliant!! Thank you so much for sharing the how-to behind this technique - much appreciated :) Your finished card is just gorgeous! I love the colours. Thank you for the how too! That is such an amazing card and easier than it looks to make! Wow! Consider my mind blown! This is stunning and I can't wait to try this myself! 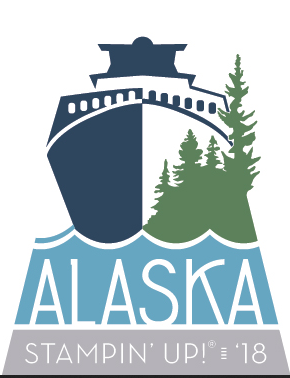 Thank-you for posting! I love the card. Is the folder still available? Hello Linda, yes the folder is still available, and can be found in the Stampin' Up "Handmade for the Season" catalogue. 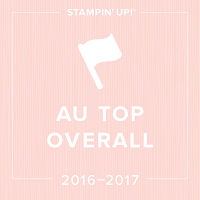 # 139673 If you are an Australian resident you can purchase on-line through my Demonstrator website: http://www3.stampinup.com/ECWeb/default.aspx?dbwsdemoid=4000044. 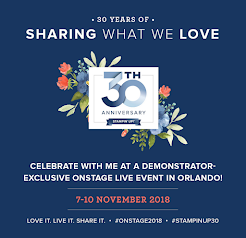 Otherwise contact your local Stampin' Up! demonstrator in your country and they will be able to help you. Love this technique. Before I stamp on back side of embossing folder, do I need to slightly sandpaper the folder? I thought I've heard someone say this before. When I tried my stamped image was blotchy (the ink did not adhere to the folder very well). I did not sand my folder - never thought of that but I don't like the idea of changing the surface. I did find it important to hold the inked stamp steadily on the folder for a second or two and lift straight off. No rocking or really hard pressure! I have since tried with a few other stamps and realize it is important to get the scale of the other images correct. Love your technique! Uniquely a special card for that special someone in your life. Thank you for the detailed instructions, they are most appreciated. 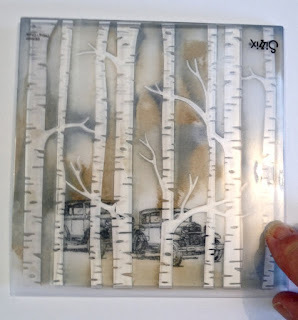 Yes, the car is from "Guy Greetings" in the current Annual Catalogue and the tree embossing folder is called "Woodland" textured embossing folder and it si in the Occasions catalogue. Your local demonstrator in the US should be able to help you order these. PS I am in the USA!!! I can't wait to try this. It is an amazing card. The effect you have created blew me away Ann! Stunning! Thank you so much for your explanation - it 'seems' really easy the way you describe it - I'll certainly give it a go! Thanks so much for sharing! I have seen many different versions of this technique, but, your cars remain my favorite! Brilliant and beautiful. Thank you so much Pat. 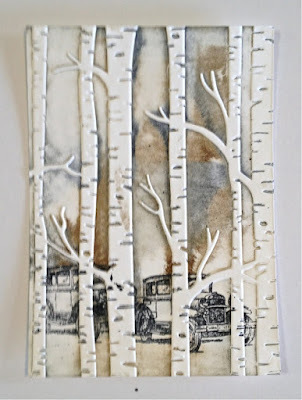 I have been amazed at all the wonderful comments I've received from sharing this technique, and yes I do think it is important for us to choose carefully what images work best behind these gorgeous embossed trees. I was playing around with different images the other day and decided one must try to get the correct size ratio between trees and stamped image. Just found you through pinterest! This is super cool!! Love this technique! Hi, my name is Sunshine and I just want to thank you for sharing this awesome technique with the Stampin' Up! 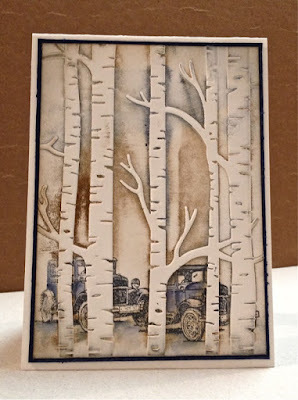 Woodlands Textured Embossing Folder! I have only just got this folder and was wondering how you get that beautiful effect.. I googled it and your card was the one that I liked the most, so I found your blog and, well, here I am! You explained it so well and it was easy-peasy to understand! I have just tried it and I just love it so much! I keep seeing this folder and LOVE it, so I must now try this technique as well. Thank you for sharing this with us. Absolutely superb, Ann!! For some reason, this is one of the most stunning cards I have seen. Maybe because it's designed for a male, or perhaps the colors. I don't know, but I do know that of all the Woodlands Embossed cards I've seen, yours is at the very TOP. Bravo!! Now I shall try doing something with mine. I have tried evey where to find the folder for the birch trees,but to no avail. It is no longer to be had. Can you help me find one? Thank you very much. Hi Diana, I believe this may be returning in the next catalogue. 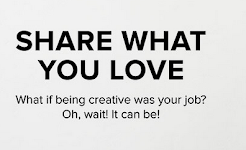 Just saw this as a pin at Pinterest, and hunted up your blog so I could read the explanation of how you created it. It's just the best look I've seen using this folder, and what a brilliant masculine card you've achieved. 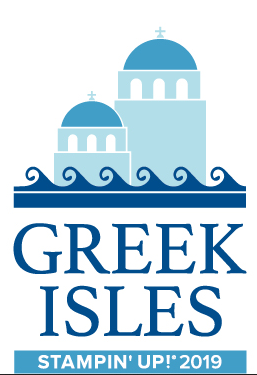 TFS - Have you bookmarked so I can get back for later visits. I cannot tell you how impressed I am by the outcome of this technique! Thank you for sharing, I can't wait to try this! Love your beautiful card and the awesome technique. 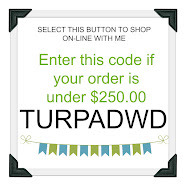 I just tried it and listed my card on Splitcoaststampers. I gave a link to your blog. http://www.splitcoaststampers.com/gallery/photo/2749810?nocache=1 Hope the link works. I absolutely am going to try this technique,as I have a deer stamp that should work really well. Love the cars and your blog. Thanks so much for sharing your creativity! Wow! I must try this! Thank you for sharing. I love this technique and your beautiful results. 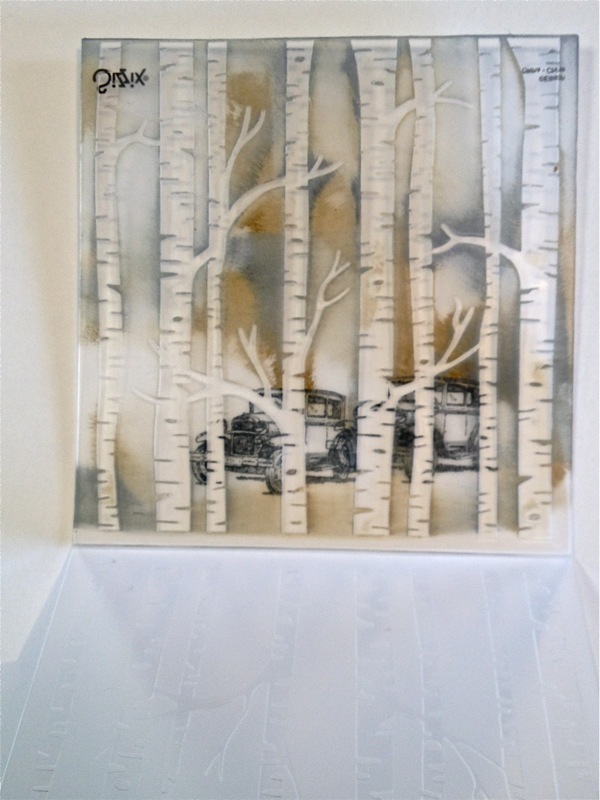 The Woodlands Embossing Folder is an all time favorite. I do have a concern, does the Memento ink permanently stain the folder? Hi Carmen, thanks for your comment. No the Memento Ink does not stain the folder if you wipe the remaining ink off quickly. Memento is water based so it cleans off easily and you need to clean the folder between each run anyway. Hi Ann. Thank you so much for your quick reply. 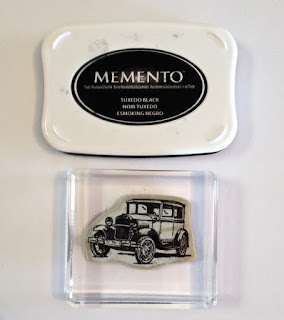 I am very excited to learn that Memento will not stain my folders and plan to try your fabulous technique today. Wow! This card is amazing! I am going to have to try this! Thanks for the great instructions! I'm not sure how you stamp the car over the trees without having the lines for the car overlap the trees. I'd appreciate finding out as I really like this technique. You've done a great job! If you stamp on the side of the folder that has the Sizzix label on the front of it, the trees are indented so the ink does not get onto that area (unless you are really heavy handed!) 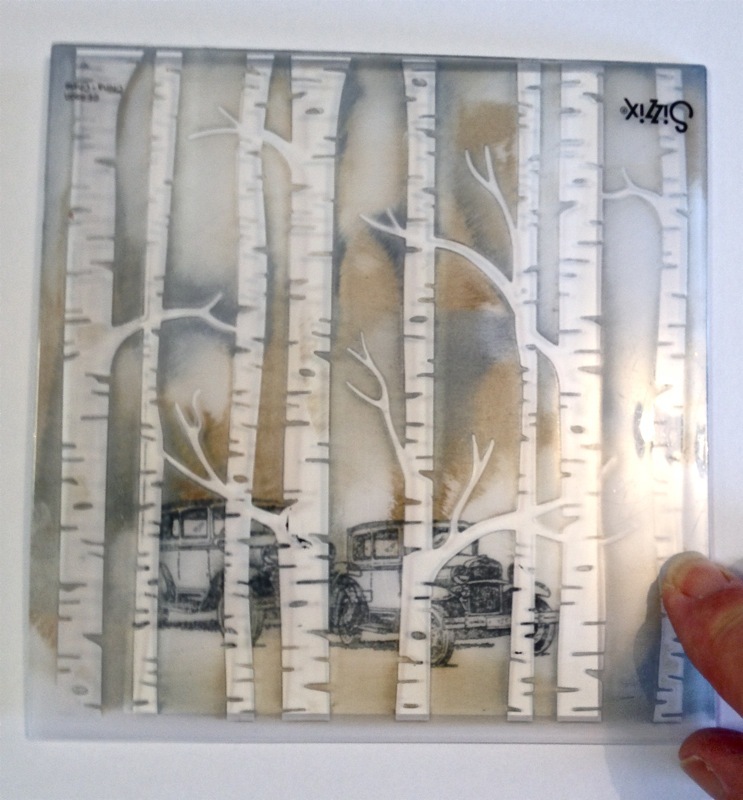 The same applies for the stamped image - keep it on that same surface and the raised trees will not have ink on them. Just give it a try - experimenting is half the fun. Will any water based ink work or does it have to be a specific kind? 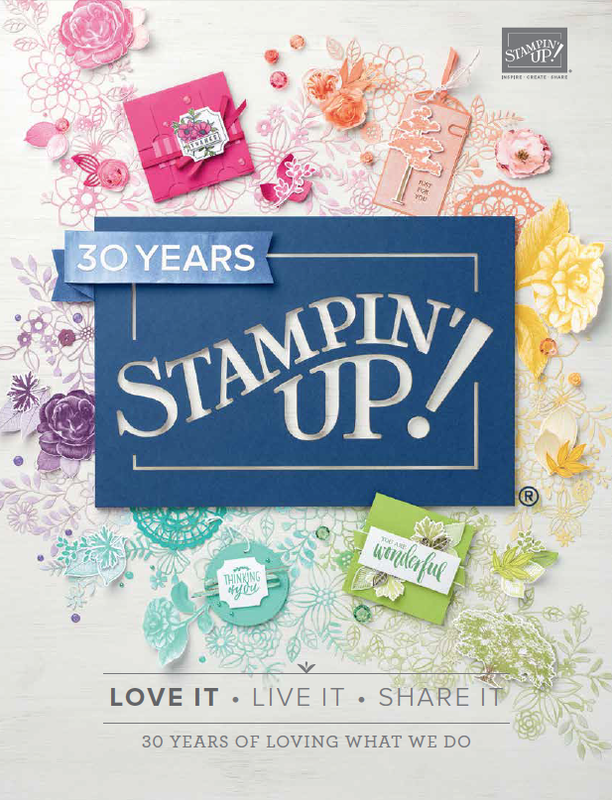 Hi Diann, I've used Stampin' Up! inks, but I'm sure any quality water based ink would work. What keeps the car black ink from transferring onto the tree trunks? I just found your card on Pinterest and am thrilled! I have been wanting to try this technique and yours is the best described. Card turned out great and I can't wait to do it again and again! Thanks so much!! I just came across your blog this morning. I love this card and especially happy to see your directions are so detailed and easy to follow. I’m definitely a follower from now on.